Ultrasound has been a beneficial tool in medicine since the 1940s, and it is used as both a treatment and diagnostic technology. Much like a submarine uses sonar, ultrasound uses sound waves by bouncing them off the body site of interest back to the sending device to create an image. The lower and slower the sound wave, the deeper or farther it penetrates, whereas higher sound waves work more at a surface level. In medicine, ultrasound is used for both soft tissue diagnostics and physical therapy. It gives doctors a better picture of a growing baby and identifies problems, such as clogged arteries or other internal organ issues. Soft tissue injuries also respond to ultrasound used in physical therapy. In skin care, ultrasound either penetrates or exfoliates. For example, gentle warming by ultrasound can assist ingredient penetration, and exfoliation using water and sound waves can remove dead skin. Esthetic devices use higher sound waves at 2,500-3,000 hertz, whereas medical devices work at lower ranges. As the devices have become more sophisticated, so have their uses. 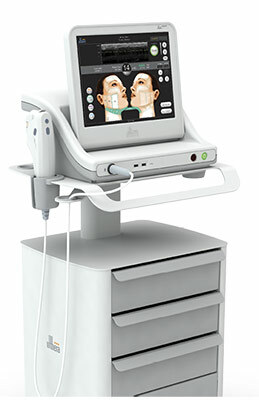 One of the most recent innovations, Ultheraa, uses ultrasound for skin tightening. Ultherapy uses sound waves at multiple depths to affect the skin. Sound wave energy converts to heat in the upper dermis, mid-dermis and deep tissue. The energy actually works as deep as a surgeon would during a face-lift procedure. This heat creates minute micro-wounds that jump-start the regenerative process and trigger new collagen formation. Similar to using radio frequency to remodel collagen on the face and body, there is no trauma to the skin. Some patients see results immediately but the real results show up over time. At three months, results are visible but not easy to capture in a photograph. At six months, visible results increase and they improve from there. In fact, biopsies have revealed new collagen is still being added even two years after the procedure. Over time, the patient notes smoothing of the décolletage as well as firming of the neck and jawline. On the face, the skin looks and feels plumper. The forehead is smoother and the brows and upper eyelids are lifted. Some clients are so pleased with their outcome, they opt to do a second treatment to appear even younger. While ultherapy cannot stop the aging process, treated skin does appear as though time were set back. Michael A. Persky, M.D., has been monitoring both ultherapy and radio frequency since their inception. In a question and answer forum, he made the following comments regarding ultherapy. Patient satisfaction is about 90% in clinical studies. Other doctors noted that ultherapy is more precise than the Titanb, which uses infrared light to stimulate collagen and tighten skin. Client happiness was 92% for ultherapy and 57% for Titan. The ideal patient for ultrasound skin tightening has mild to moderate skin laxity of the face, neck or décolletage. This means the skin should be starting to sag but not sagging to an extreme. Patients with severe loss of elasticity, lines and wrinkles are better candidates for surgery. 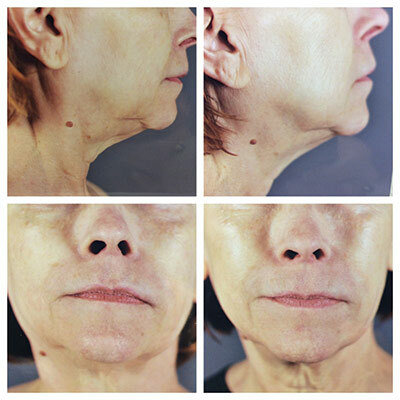 Younger women are using ultherapy to stop the initial signs of aging, such as firming the jaw or neckline. It is also popular among women in their 40s and 50s. Women in their 60s, who have mild to moderate laxity, will see equal improvement as those who are younger. It is more about the skin condition than a specific age. An initial consultation will determine a patient’s candidacy. A detailed health and medical history will ensure it is a safe and appropriate procedure for the patient. It is important for the patient to understand what to expect before, during and after the process. The treatment itself is technique-dependent. The best outcomes take an investment of time, training and practice by the technician. A physician, nurse or medical assistant generally performs the therapy, and there is a significant learning curve to reading the ultrasound readout display. For maximum results, the therapist must monitor and adjust the settings throughout the treatment. While device manufacturers note results will vary, the skill level of the therapist directly relates to the outcome. Because the procedure works in the deep layers of the skin, delayed bruising can occur 24+ hours following the treatment. Some doctors therefore suggest use of Arnica montana before treatment and for a day or two following the procedure. The arnica helps keep bruising to a minimum. The multiple passes and depth of energy flow can make it uncomfortable for the patient, so most offices require the patient to arrange for a driver. When the patient arrives, they provide a mild relaxant and painkiller. A relaxed, comfortable client does much better with the numerous passes. It also helps over thin skin, where there is less “padding” and bony areas. I decided to try this procedure for two reasons. First, I am a baby boomer who prefers non-invasive methods to fight aging. Second, as an industry insider, I wanted to see what I could learn and share with my peers. The more we know, the better we can assist our clients. For my treatment, I put my face in the trusted hands of Mark Jewell, M.D., at Jewell District Medical Spa. Previously, I have had the pleasure of working with Jewell, whose specialty is in plastic surgery and who is well-known for his skill with injections. After verifying that I had arranged transportation, the staff at Jewell District Medical Spa provided the medications. My nurse, Keri, made sure I knew what was happening with each step so there were no surprises. Since ultherapy is a single treatment, every client needs this information. There were different energy sensations throughout the treatment. Her communications made it more comfortable and reduced my treatment anxiety. After my treatment, I followed their guidelines and spent a quiet evening dozing off the effects of the medications. My skin showed no visible irritation or redness. My neck had mild edema. The next day, all oral anesthetics were completely gone, and I felt great. There was no redness or significant puffiness to my skin. My neck looked smoother. I had pretreated with Arnica montana because I bruise easily, but I did find two tiny bruise marks. Camouflage makeup easily covered the bruising. My skin was not sensitive to touch, and there was no skin discomfort. However, my face and neck muscles felt as though I had perhaps overdone isometric exercises. Touch pressure made me aware of tender muscles underneath. The staff clarified that light facials would be fine at that time, but to avoid deep pressure. I kept up my normal skin care regime of mild daily skin exfoliation, antioxidant therapy, peptide therapy and protection. On the third day, mild bruising appeared along the jawline. Due to the depth of the work, it can take 2-3 days for bruising to show, so it would be good to consider any major upcoming social events when scheduling the treatment. As with all medical procedures, allow time to heal, even if there is no visible wound. The muscles of the platysma continued to be tender to pressure or certain movement. As a patient, I knew something was happening. By the end of the first week, pressure tenderness remained along bony protrusions. At the end of four weeks, most of the tenderness was gone. Only under the chin area did I still feel sensitive to pressure. The persistence indicated the depth of the treatment, but the skin itself was never sensitive. Some pressure sensitivity can even last four to six weeks. In three months, I felt I could see a distinct change. My neck, jawline and cheeks appeared more lifted. At six months, people were asking me what I had done differently. On a follow-up visit, though, the staff noted the challenge of getting good before and after photos since the results are more subtle than cosmetic surgery. They saw consistent improvement in all patients, but not all of them got the level of improvement put forth in the manufacturer’s photos. Regardless, clients felt pleased to very pleased with at least moderate improvement, lifted/toned skin, smoother skin and plumper/firmer skin. Necks, jawlines and brows all showed definite improvement. Clients who undergo this service will be pressure-sensitive for some time, so avoid deep massage and all pressure treatments. Microdermabrasion or facial toning would be uncomfortable and could delay healing. For the first month, only use light touch and no extraction. A chemical exfoliation and hydration would be fine. In addition, LED promotes healing and reduces any sub-clinical (non-visible) inflammation. A collagen blanket mask would also be a good choice. Make sure the client has good anti-aging home care including antioxidants, peptides, sunscreen and smoothing/firming agents. Have the client use a gentle touch if they use scrubs at home. An ultherapy client is also an excellent candidate for services that will enhance her investment. LED, facial toning, chemical exfoliation and mixed modalities would all be beneficial. Esthetic therapies will support, augment and extend her medical intervention. If you have clients who are considering this procedure, be sure they are aware of the probability of delayed bruising. If they are pretreating with Arnica montana, have them continue to use it for several days following the treatment. As noted, due to the depth of the work and micro injuries, it takes time for bruising to rise to the surface. Some bruising could take a week or two to fade. Ultherapy offers a way to slow down the hands of time and improve the appearance and contours of the face, neck and décolletage. The improvement of lines on the chest is especially pronounced on women with larger breasts. Again, improvements are not immediate, but the skin continues to improve over the first two years. Remember to support ultherapy treatments with appropriate anti-aging home care and in-clinic skin care therapies. This will lead to the best outcome and extend the results for the client. a The Ulthera device is manufactured by Ulthera Inc.
bTitan is a device manufactured by Cutera. 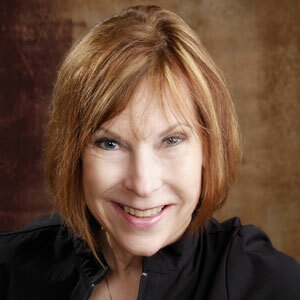 Judith Culp, CIDESCO Diplomat, NCEA Certified, CPCP, is a 35-year industry veteran with an extensive writing background who offers consulting and content writing services to the spa industry. She can be reached at estheticsnw@msn.com.